© 2018 Mercedes-Benz Canada Inc. 2018 GLC 300 4MATIC SUV shown above. MSRP starting at $59,900. 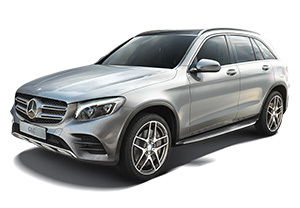 **Lease and finance offers for the 2018 GLC (excluding AMG) available only through Mercedes-Benz Financial Services on approved credit for a limited time. Lease APR of 3.9% applies up to 36 months. Finance APR of 2.9% applies up to 60 months. Freight/PDI of $2,695 ($3,495 for AMG models), dealer admin fee of $595, dealer documentation fee of $595, air-conditioning levy of $100, EHF tires, filters, batteries of $25, and PPSA of $39.30 are due at signing. MSRP starting at $45,900. First, second and third month payment waivers are capped for the 2018 GLC 300 4MATIC SUV up to a total of $550 (including taxes) for lease programs and up to a total of $750 (including taxes) for finance programs. The loyalty program offers a 1% rate reduction off of the lowest posted lease (minimum lease rate is 0.00%), retail finance or star advantage rate on new and demonstrator Mercedes-Benz passenger car vehicles (minimum finance rate is 0.00%). To be eligible, a customer must have leased or financed a new or pre-owned Mercedes-Benz with Mercedes-Benz Financial Services and currently have an active account or had an active account within the last 6 months. Certain limitations apply. Vehicle license, insurance, registration, and taxes are extra. Dealer may sell for less. Offers may change without notice and cannot be combined with offers. See Mercedes-Benz Surrey for details or call (604) 581-7662. Offers end April 30, 2018.